A comprehensive support system for RISO & PRINT GOCCO products with training notes, projects and a world first - Video demonstrations of the PRINT GOCCO systems! The greatest revolution in information & support in the history of PRINT GOCCO. All the information you need, plus much more, at your fingertips 24hrs a day to ensure you get the most out of your system. Operation Manuals - Complete guide to operating the machine including Artwork preparation, imaging Print Masters, Inking techniques, Printing, making Screen Printing screens, Screen printing technique, using the hand stamper & much more. Video Gallery - The most important aspect of the CD is the video demonstrations of Screen printing, Ceramics and PRINT GOCCO printing. Learn how to create screens & print in different machines and for different applications - all with the touch of a button. Product Demonstration - a 13min. demonstration of the NEHOC systems for screen printing, plus videos on ceramics, paper/ card printing and stamp printing. Sit back and watch the systems potential. Bonus Extras and special website support links. Simply insert your CD into the computer and click the 'Register CD' button to receive FREE upgrades. Just complete the form with your details and CD version and you will receive the next version completely FREE! 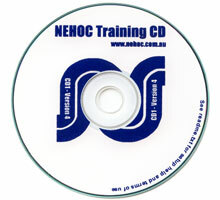 Insert CD into computer CD-ROM or DVD drive and CD will autoplay. Do not touch CD surface with fingers. Return CD to protective storage case or sleeve immediately after use. Use only professional CD cleaner if required. Do not clean with solvents or abrasive materials.